Pakistan is one of the fastest growing nations in the world. It risks being the fifth most populous country in the world, given the current status of the rapid population growth according to a report by UNFPA. Rapid population growth poses an economic challenge to a country as it requires more resources for sustainable development. The current population growth rate of Pakistan is projected to reach 300 million by the year 2050. Indeed such population dynamics can and do impede the economic growth of a country. Rise in population is experienced by a country with high mortality and fertility rates. However, effective public health interventions involving medical and health systems’ improvement (focused on maternal and child healthcare) can reduce these rates. This, coupled with higher literacy rates result in societal changes that welcome smaller families. In turn, the share of population of individuals who are dependent on the working age population grows smaller, thus liberating investment and resources essential in economic development and family welfare. When this cohort of productivity is efficiently employed, there rises an opportunity to expedite the economic growth of the country. This window of opportunity is the “demographic dividend”. This hinges upon the country’s employment practices, rise in working-age population’s timing, level of childbearing, women’s empowerment, and policies that make it easier for young parents to work, in addition to other advances. Achieving the crux of demographic dividend depends on the implementation of these policies. As Pakistan struggles with its rapidly growing population, a crushing burden is posed on the country’s economy. The demographic dividend precursor needs to be catalyzed in this region by wider and deeper interventions involving investments in health, safe water, sanitation, vaccination and drugs. All of these can improve child survival significantly (an essential precursor of demographic dividend). Unfortunately, in recent years, the population factor and its associated concerns have been adjourned in the development debate and in the mindsets of planners and policy makers in Pakistan. This has caused a stagnation of results, which are evident in the given economic stress of the country. 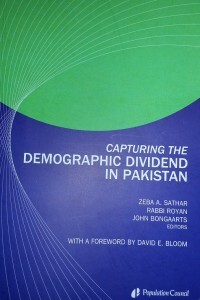 It is in this context, that Dr. Zeba Sattar of Population Council, Rabbi Royan of UNFPA and John Bongaarts of Population Council have jointly authored their book, Capturing the Demographic Dividend in Pakistan which was launched in Islamabad, Pakistan on May 10, 2013. The book focuses on critical issues of health, employment, youth and gender in Pakistan. The book serves as a blueprint because it suggests ways forward on the inter-sectoral approach in population and development, given its current status. It is particularly important for policy-makers who focus on education, employment, youth, gender and governance. The book documents the evidence of development linkages seen in the prospective of demographic division as it digs deeper by suggesting solutions. According to David Bloom, , demographic dividend can be accelerated in regions that continues to have high fertility and mortality rates via provision of family planning supplies and services. This can also be achieved by expansion of education and job opportunities for women. For regions that have already experienced a reasonable decline of death and birthrates, the challenge is to capture the benefits of demographic dividend which are also dependent on women empowerment and equal employment opportunities. This is an essential precursor for demographic dividend as no country has been able to achieve demographic dividend with 20-25% female employment. The book serves as a watershed in the sense that it draws reproductive health issues that had been duct away for a long time. At the book launch, Dr. Rabbi Royan urged that efforts be activated to conduct the population in housing consensus at the soonest. He mentioned that the last population and housing consensus was done in 1998 and the next round of national development will be well served if the current accurate and well analyzed data the new consensus will yield. In order to really get the desired results from this opportunity, the new Pakistani Government will have to ensure education of every citizen. POlicies really ought to reflect the onground situation. Perhaps, as in the UK, students can be given incentives for going to schools and parents can be given incentives for having fewer children. Initial reform will only come about through incentive-prone policy.